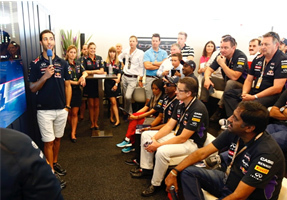 3 May 2016, Singapore – Race promoter Singapore GP today released a new Red Bull Racing Turbo Seats package for the regular ticketing phase that provides fans an exclusive evening with the team’s drivers, a seat at the Pit Grandstand, as well as official team memorabilia. 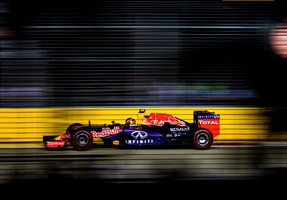 Singapore GP has collaborated with Red Bull Racing for a comprehensive four-day package featuring a host of benefits for fans of the Formula 1® team. The Turbo Seats package offers ticketholders the coveted opportunity to rub shoulders with Red Bull Racing drivers Daniel Ricciardo and Max Verstappen as well as Team Principal Christian Horner at an exclusive Red Bull Racing event held at the Singapore Formula One Paddock Club™ on Thursday evening (15 September). Fans will gain an insight into the team’s preparations for the race whilst enjoying a gastronomic spread at the Red Bull Racing Hospitality Suite. Guests will also receive a Turbo Seats Supporters Pack consisting of a cap, team flag and team lanyard so they can show their support at the night race. As an added incentive, Turbo Seats package holders automatically enter a draw for a chance to win a pair of signed framed Daniel Ricciardo Racing Gloves or a chance to watch the Formula 1® Qualifying in style from the Red Bull Racing Hospitality Suite. Over the race weekend from 16 to 18 September, Red Bull Racing Turbo Seats ticketholders will enjoy a superb view of the pit straight and the team in action from their Pit Grandstand seats directly opposite the Red Bull Racing garage. The package also includes a discount voucher that can be used to purchase official team memorabilia as well as meal vouchers worth S$90 to be redeemed at the Marina Bay Street Circuit. The Red Bull Racing Turbo Seats package is priced at S$1,925 and is available from today at www.singaporegp.sg. A maximum of five tickets are allowed per person. Tickets for the 2016 FORMULA 1 SINGAPORE AIRLINES SINGAPORE GRAND PRIX are on sale via www.singaporegp.sg, the ticketing hotline +65 6738 6738 as well as all Singapore GP’s authorised agents.